Several application examples and results corresponding to European refineries are commented. 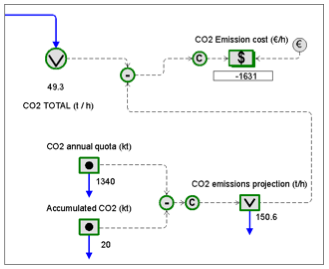 How to integrate CO2 emission costs and constraints within the overall energy system on line models and their optimization is also explained. Many industries are facing increasing tax pressures to reduce greenhouse gases emission because of their countries adherence to the Kyoto protocol. They are challenged to optimize their energy systems with the goal of maintaining or reducing their CO2 emissions within a trading market environment but, at the same time, to maintain their competitiveness. 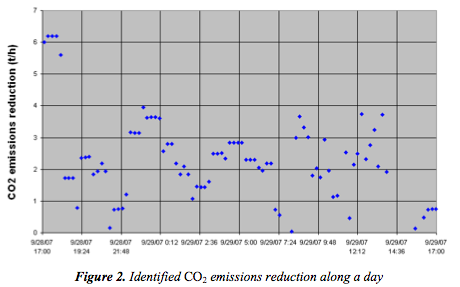 In the case of refineries, chemical and petrochemical plants, which usually operate complex energy systems, CO2 emissions introduce an additional factor to the complexity of the energy costs reduction challenge. Moreover, since energy represents usually their main cost after feedstock, its reduction is more of a bottom line business decision than a challenge. Process plants use different type of fuels, they often operate cogeneration units, their steam networks consists of several pressure levels, there are different types of energy consumers and there are emission limits to be observed. Import or export of electricity in deregulated markets, which could also be traded off with more or less CO2 and other contaminant gases emissions, increase the optimization problem complexity. In order to successfully address the energy system management, the Visual MESA software is widely used at refineries and petrochemical complexes (Ref 1). It is a Real Time Optimization application that is saving refineries all over the world millions of Euros per year by advising on optimal operating conditions of their utilities systems, comprising steam, fuels, electricity, etc. Visual MESA has been adopted by the leading refiners worldwide and is the first choice in the segment of online energy optimization. At these sites were Visual MESA is in use, the operators always have available a set of recommendations to operate the energy system at a minimum cost under the current site production scenario. The tool also acts as a "watch dog" since supervisors can evaluate how operators manage the energy system based on the Key Performance Indicators being generated. Prior to applying the optimizing recommendations (or when they are not taken into account) variability in the way the energy system is operated is big and large potential benefits are frequently found. As soon as Visual MESA is commissioned and in use, this variability is noticeably reduced or eliminated, as it was reported by many implementations (see References 2, 3, 4, 5 and 6). 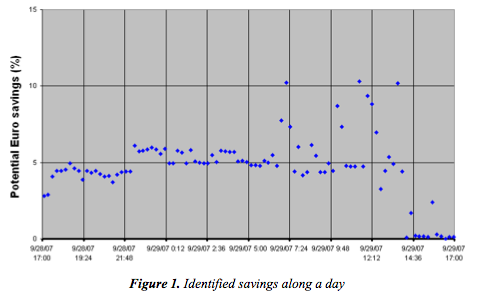 Figure 1 shows an example of the savings found in a refinery during a day of operation (expressed as a % of the total energy costs) when compared with the way operators use to operate without any advisory help. 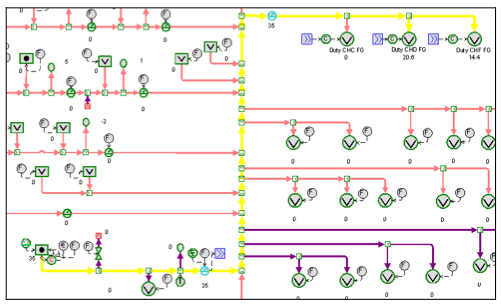 Each point in the plot corresponds to an automatic Visual MESA run. Note the decrease in the potential savings when operators begin to apply the recommendations (last three hours of the day shown). This means that savings are being captured. 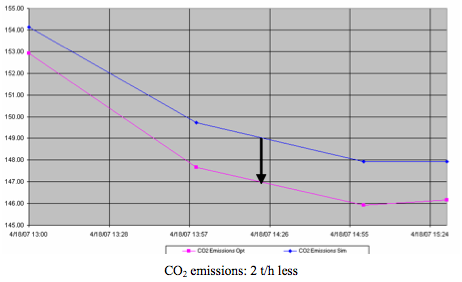 Figure 2 shows the corresponding potential reduction in CO2 emissions found for the same example during the same period and the same set of recommendations. For this particular example, an average of 2 t/h of CO2 emissions savings were achieved (more than 17 Kt/year), helping to obtain also economic savings of 5% over the total energy costs. The cost of CO2 emissions is taken into account by the Visual MESA model together with all the other existing purchase and supply contracts of fuels, steam, water and electricity. The CO2 emissions modeling and economics must be configured according to each site's specific needs. 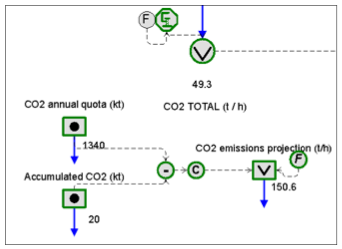 Thanks to the availability of powerful and versatile calculation blocks within Visual MESA, it is possible to model the emissions factors for each fuel and also the costs and constraints associated to the CO2 emissions, taking into account all the contractual and operation details of a given site. For each ton of CO2 emitted a price equal to the emission allowance price is assigned (plus the applicable taxes). This approach is not fully realistic from the accounting perspective, unless the plant has exceeded the CO2 emissions quota. However, it assures that the optimization will be always focused on minimizing CO2 emissions. 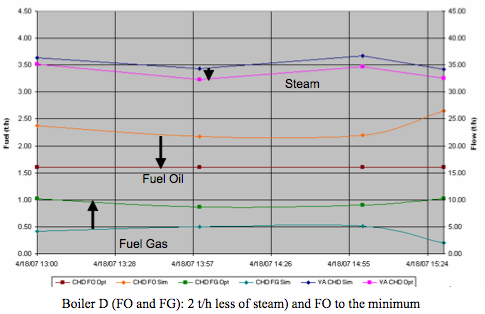 This approach may influence the optimization results in those cases that a compromise between using a more expensive fuel with less CO2 emissions and a cheaper fuel with more CO2 emissions exists. It will, in fact, penalize the cheaper fuel. The first real industrial example corresponds to TOTAL Feyzin refinery (Ref 7). TOTAL is a leading refiner-marketer operating 11 refineries directly in Western Europe. The reduction of greenhouse emissions and the enhancement of energy efficiency are among the Company corporate challenges. 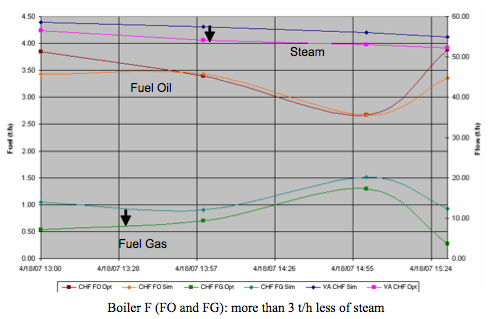 As a result of the manual change in the boilers fuels diet (more FG and less FO in the overall), the Fuel Gas header pressure control system made the necessary adjustments which resulted in the need to increment Natural Gas import. This third example corresponds to a Repsol YPF refinery (Ref 4). Repsol YPF is the largest petroleum refiner in Spain and Argentina, also conducting operations in Peru and Brazil. 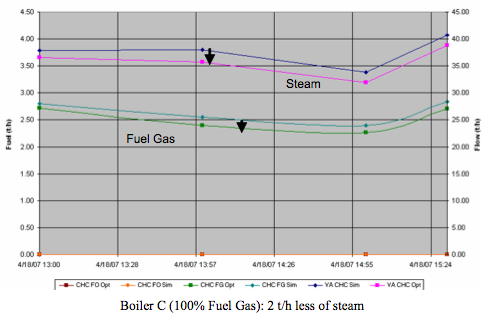 The evaluation of the economical impact of adding a new Natural Gas line feed to the Gas Turbine has been done. This investment project would allow the replacement of its Gas Oil feed. 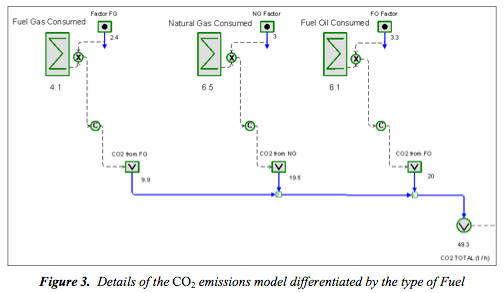 Real industrial examples have been presented in which, with the existing equipment, CO2 emissions reduction were achieved while optimizing the energy system using an on line software tool. Optimization is configured to give recommendations to operations personnel on a daily basis. CO2 emissions cost has been taken into account in several ways, each one adapted to the each site's particular operation needs.